At the beginning of this summer, Jenny & I headed down to the north end of Canandaigua Lake for a picnic. We’d stopped by Wegmans to grab dinner: a sub with chips and soda for me, and roast turkey sandwich with a side of Hawaiian salad for Jen. As we sat on our picnic blanket gazing out at the lake, she offered me a taste of the fluffy desert salad on her plate. I’m not a big fan of ambrosia, so I took only a small forkful. And then, I proceeded to eat the rest of her salad. Fortunately, Jenny didn’t mind. I don’t think. At the risk of losing friends, I knew I had to try and recreate it at home. The pineapple flavor stands out the most, with notes of citrus and coconut poking their way through, but it’s all tempered by the mellow undertones of sour cream and marshmallow. The texture features prominently too — it’s cool and creamy, mildly crunchy and, because the fruits’ acids dissolve the marshmallows a tiny bit, soft and springy. The one difference between this version and Wegmans’ is that this is a bit more liquidy, probably because I used low fat sour cream. It should be noted, however, that when I first mixed all the ingredients together, the salad was downright soupy but, after an hour in the fridge, the salad thickened up. 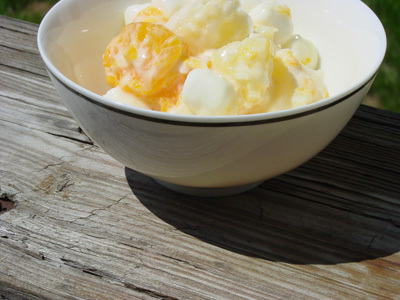 In a medium bowl, combine pineapple, coconut, marshmallows and sugar until evenly distributed. Add sour cream; mix to combine. Gently fold in oranges. (Mixture will be soupy.) Cover bowl and chill for at least an hour.